How To Stop Panic Attacks Naturally? 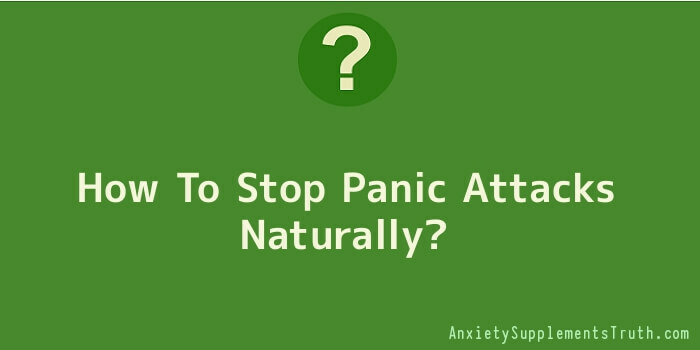 If you are looking at how to stop panic attacks naturally, here are some ideas to help you. Panic attacks are brought on by anxiety and worry, two very common emotions in today’s world. Nobody is immune to having a panic attack, but everyone is able to put preventative measures into place so that their risk of getting panic attacks is reduced. Whether you are currently suffering from a panic attack or just do not want to deal with another one again, the following five steps can help you when it comes to naturally treating panic attacks. Physical symptoms are where anxiety and panic attacks often are noticed first. You may become tense, start to sweat, and feel your heart beating too fast. The trick to treating panic attacks is to notice when these physical symptoms are present and to take action to get rid of them. Try to relax your body and return it to its normal state. You can do this by using relaxation techniques. Take big, deep breaths from your abdominal area and let your breath relax you and then start to relax your muscles one by one. You can do this by consciously paying attention to each muscle and allowing it to fully relax, starting in your feet and working your way up to your head. Even though relaxing your body will help your mind relax, you still have to put some effort towards relaxing your mind as well. One great way to do this is meditation. I know, you may be wondering how you could possibly meditate when you feel worked up, but meditation doesn’t mean you have to sit with your eyes closed and fall into a trance. You can easily mimic meditation by obtaining a guided meditation like a binaural beat or even someone’s voice. A guided meditation will allow you to focus your attention on a sound (besides your own thoughts) and allow you to become relaxed. Our thoughts have a way of getting carried away if we let them. If we do not focus on realistic thoughts then we can make up a story in our head that causes all kinds of anxiety. Being able to recognize irrational thoughts is essential towards treating panic attacks. Catastrophe thoughts are the most common irrational thought pattern. This type of thought is when you let your fear get the better of you and you start to think of worst case scenarios. Normally, you start by saying things like ‘What if?’ and then you overestimate or underestimate a situation that will likely not even happen. Once you recognize what irrational thoughts are, and are aware of when you are starting to think them, then you can start to face them head on instead of letting them take control of you and causing anxiety. 1. Picturing the real worst case scenario. Once you do that you will realize that the worst case scenario is pretty unlikely to happen, and it may remove your ‘what if’ and replace it with ‘not likely’. 2. Tell yourself something better. For instance if you are starting to get anxious over a public speech you have to make, and you are picturing being nervous and horrible, then tell yourself something better. Try to picture feeling great while talking and knowing that the audience loves you. Make the outcome different in your head and your emotions will start to follow. 3. Weigh the odds of the anxiety filled thought happening. The worst case scenario may be something like losing your job or house. Realistically, weigh the odds of the worst case scenario actually happening and you will most likely find that it is very slim. 4. Remember that there are alternatives. When you are anxious you are usually thinking of one result. This is never the case. There are always options. So if you are getting anxious about losing your job then remember that even if you do, there are things you can do afterwards to recover, and life will not necessarily take a definite turn for the worse. One of the best ways to overcome a phobia of any kind is to face it. Facing your fears will allow you to realize the truth about your anxious thoughts and feelings. Many people find this highly useful when treating panic attacks. You can do this with gradual exposure. For example, if you become anxious in social situations then start exposing yourself to more social situations on a gradual basis. Let yourself interact more and more on a daily basis until you start to become more comfortable with it. Your anxiety will start to subside the more you do this because you will feel more comfortable, and less fearful, of interacting socially. There are other things that can help in treating panic attacks naturally such as getting regular exercise, eating a proper diet, incorporating good sleep habits and simplifying your life. Hopefully, this has helped you in finding ways of how stop panic attacks naturally and create an anxiety-free life.